If your credit isn’t that great or you don’t have a lot of credit history to speak of, signing up for a credit card that is geared to consumers like you can make a lot of sense. Since the Capital One Platinum card is for people with average credit, you have a good chance at qualifying for this card if you’ve made mistakes in the past. We like the fact this card doesn’t have an annual fee, but its perks really help it stand out. While the interest rate is high, we feel this is a solid card option to consider if you plan to use credit for small purchases and never carry a balance. From the very beginning, the Capital One Platinum card sets you up for success with several credit-building tools. It all starts with their CreditWise feature – a free credit monitoring portal you can access to see your credit score and monitor your credit profile. This is free and available for anyone whether they have a Capital One card or not, but it’s still worth mentioning since monitoring your credit is the best way to make sure you’re improving it over time. Unfortunately, the Capital One Platinum card is likely to start you off with a pretty small credit line. The standard credit limit for the card is $300 (and can range upwards, depending on your score). $300 is a fairly standard limit for a card targeted to consumers with lower credit scores, but you may have better options if you can afford to put down a deposit on a secured card. The Discover it Secured card, for example, allows you to secure up to $2,500 in credit. A larger credit line can help you build your credit faster, since it helps lower your credit utilization ratio – a major factor in your credit score. On the plus side, the Capital One Platinum card puts you on the fast track to qualifying for a larger credit line – you can qualify for more open credit after only five on-time monthly payments. Another reason to consider this card is just how simple it is to use. Capital One’s mobile app makes it easy to manage your account, bank online and pay your bill from your mobile device. You also have the option to set up account alerts that notify you when you’ve made a purchase or a payment is due, along with the option to pick your own due date and payment method. Finally, you can set your account up on autopay so you’ll never forget your monthly bill. Capital One is also highly regarded for its 24/7 live customer service that is available to assist you with issues you can’t resolve online. Also note that the Capital One Platinum card doesn’t charge an annual fee. Since many cards marketed to consumers with poor or fair credit tend to require a membership fee or a large security deposit, this is a big plus. You have the potential to build your credit profile with the Capital One Platinum card for free provided you pay your balance each month and never pay credit card interest. Speaking of interest, the Capital One Platinum card is not a card you’ll want to carry a balance on. This is due to its high variable APR of 26.96 percent. Considering the average credit card interest rate is hovering around 20 percent, you could easily find a similar card with a lower APR to apply for. If you do sign up for this card to build credit and take advantage of cardholder perks, you should create a plan to pay your balance in full each month. Only charge small purchases you can pay off right away and consider signing your account up for autopay. Another major downside to consider with this card is that it doesn’t offer a rewards program. Since a handful of credit cards geared at consumers with average credit offer the opportunity to earn cash back, this is disappointing. If you hope to earn rewards on your spending, it can pay to compare credit cards in terms of their consumer perks and their rewards programs. At a bare minimum, cards with rewards programs offer at least 1-percent cash-back. 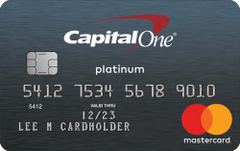 The Capital One Platinum card is lighter on fees and penalties than similar cards. The card doesn’t incur a penalty APR in case you miss a payment (though it does charge a late payment fee), doesn’t charge a fee for returned payments, and, most notably, doesn’t charge a foreign transaction fee, which means you can use the card for purchases outside the U.S. without having to pay extra for the privilege. You’ll want to avoid using the card to make cash advances, though, since the cash advance APR is high, not to mention you have to pay a 3 percent fee (or $10, whichever is greater) on each advance. Consumer protections – Enjoy cardholder perks such as travel accident insurance, auto rental coverage, extended warranties, price protection, 24-hour roadside assistance and 24-hour travel assistance services. Credit-building tools – Capital One’s CreditWise service makes it easy to check in on your credit score and monitor your credit over time. Fraud coverage – Rest assured you won’t be responsible for fraudulent charges if your credit card is lost or stolen. Mobile app – Use Capital One’s mobile app to conveniently monitor your credit card account or pay your bill from anywhere. According to Capital One, this card is geared to consumers with average credit or better. This typically means a FICO score of 580 or higher. Capital One also notes that you could still qualify for this card if you’ve defaulted on a loan in the last five years or you have less than three years of credit history. To apply for this card, you need to be at least 18 years of age and have adequate monthly income to qualify for a line of credit. Capital One will check your credit report and employment history and may reach out to you if they need additional information. Why get the Capital One Platinum card? You want an opportunity to build credit without an annual fee. You don’t want to build credit with a secured credit card that requires an up-front deposit. You want valuable consumer perks such as extended warranties, price protection and travel accident insurance. Your credit is average but not great. You want a card that will increase your credit limit over time with responsible use. You want to use credit to build your credit history but you don’t care about earning rewards. Use the card for regular purchases you can afford to pay off each month. Never carry a balance since you’ll be charged a high APR if you do. Don’t miss a payment. Capital One may charge a late payment fee that could be as high as $38. Keep your credit utilization low, particularly when your credit limit is low. If you only have a $500 credit limit and charge it up right away, your credit utilization will rise and potentially cause your credit score to take a hit. Strive to use your card only for small purchases you can pay off right away. Use your card for large purchases that might benefit from perks like extended warranties and price protection.